Photosynthesis – 7th grade science taught me that too much CO2 is bad. You remember science class when you were a child, don’t you?…Remember the “life-cycle” science? Good, now convert back to a child & stick w/that science. Bc this new science insists that these extreme levels of CO2 is good. No, it’s still bad. Ask the Chinese. You see them on the streets w/masks; selling & buying oxygen in mass bc they can barely breath. Don’t believe this pseudo science. Don’t believe “Climate Change” that was once called “Global Warming.” Why the change? Bc “warming” seems a little silly considering the east coast is experiencing abnormal extreme freezing temperatures. Blobs & Climate Change…seriously? Just yesterday or a couple days ago I posted about the massive CO2 levels & today I see this article (almost like it’s a counter to what I wrote). Carbon dioxide – the gas scientists say is most responsible for global warming – reached a significant symbolic milestone in our atmosphere this month, the Scripps Institution of Oceanography said. 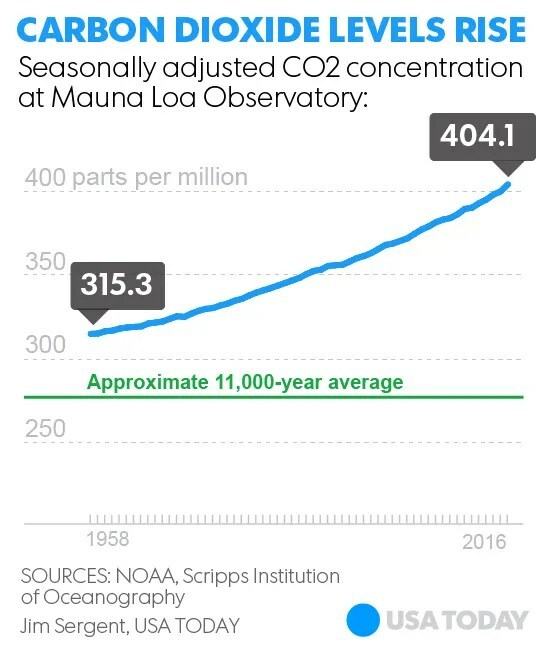 For the 1st time, daily & weekly values of carbon dioxide in our planet’s atmosphere have remained above 400 parts per million, said Scripps scientist Ralph Keeling, keeper of his father’s famed “Keeling Curve,” the longest continuous record of atmospheric carbon dioxide on Earth. Ralph Keeling & his late father Charles David Keeling have kept CO2 measurements at the Mauna Loa Observatory in Hawaii since 1958. “We won’t be seeing a monthly value below 400 ppm this year – or ever again for the indefinite future,” Keeling wrote in a recent blog post. “the planet more dangerous & inhospitable for future generations,” the World Meteorological Organization has said. Increasing amounts of carbon dioxide & other gases are enhancing the planet’s natural “greenhouse effect.” Based on paleoclimatic evidence, the last time carbon dioxide reached 400 ppm was millions of years ago, according to the journal Nature Geoscience. A 2009 report in the journal found evidence of CO2 levels of 365 ppm to 415 ppm roughly 4.5 million years ago. CO2 levels were around 280 ppm prior to the Industrial Revolution in the late 1800s, when large amounts of greenhouse gases began to be released by the burning of fossil fuels. The burning of the oil, gas & coal for energy releases greenhouse gases such as carbon dioxide & methane. These gases have caused the Earth’s temperature to rise over the past century to levels that cannot be explained by natural variability. Carbon dioxide is invisible, odorless & colorless, yet it’s responsible for 63% of the warming attributable to all greenhouse gases, according to NOAA’s Earth System Research Laboratory in Boulder, Colo. Levels of carbon dioxide go up & down each year, reaching their highest levels in May & then going back down in the fall as plants absorb the gas. “By November, we will be marching up the rising half of the cycle, pushing toward new highs & perhaps even breaking the 410 ppm barrier,” Keeling said.